As we are known to do at Flush, we’re constantly walking out on the creative wilds and mapping the inspiring fertile lay lines of the world. As soon as we discover a blushing fecund oasis of fruitful delights, well we just got to come running back as fast as our little legs will carry us to scream from the heights about our new find. Or we’ll send word via the baby digital raven that is Twitter. That thankfully gives us more time to go wander the artistic frontiers. 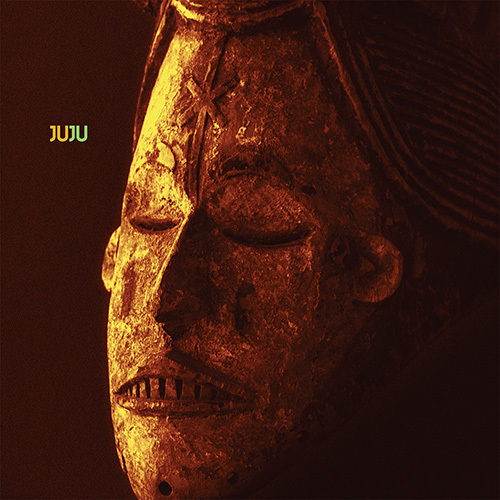 One such recent jewel of discovery is the sonic fountain of Juju. Crafted from the mind(s) of Gioele Valenti (formally of Lay Llamas, Herself) who based in Sicily and clearly a European lay line hotspot, he weaves the sounds of generations, dimensions, the past, the now, the future and creates a synesthesia of an album that despite potential nods to prog rock is a thoroughly modern incantation of an album. Such modernity in it’s construction that suffuses the album has more in keeping with Primal Scream’s ‘Vanishing Point’ (1997) as multiple dreamy and stark influences are sampled, looped and woven into the mescaline beats and grooves. Sharp contrast and rhythmic repetition lull and seduce us, tapping into ancient layers that would have been honoured and respected since pagan or tribal days, there is definitely an organic caress emanating from the tracks. Opening with the ominous drudging, hypnotic, brooding beats and chants of ‘Samael’ one would expect we’re at the departure gates to a very dark journey, bad trip indeed. And in reference to some of the information sent with the album about subject matters such as ‘the story of an on-going exodus from Africa that more often than not ends in ignored tragedies at sea, a total defeat for humanity’ there is a stark reality at the foundation to the listing of sounds. The contrast of ‘We Spit On Yer Grave’ which despite it’s title actually sounds like A War On Drugs being sung by Jim Reid from The Jesus And Mary Chain after finding a big bubbly bag of Es, and as such is somewhat encouraging in building a euphoria of the now and a desire to jump about at some sort of ceremony in a field celebrating all the enveloping warm beauty of Nature. The hypnosis and seduction continues in ‘Stars An Sea’ as it begins deceptively slow, a pulsating foundation, gentle contemplative steps almost imperceptibly building to what is basically jumping off an aural cliff into a free fall of a joyous guitar led trippy crescendo. It’s going to be an incredible live track to say the least. Plaintive distant echoing piano seemingly played on a foggy sea, with hints of The Avalanches via samples and loops make up the continuing trip that is ‘Dance With The Fish’. The crystal like contrast of Sunrise Ocean splits the fog like a lighthouse beam with a much cleaner rock groove that soon starts to warp and bend reality into far more psychedelic fare that has a solid dirty funk and saw dusted spit stained floors vibe to it, though with hints of techno sounds being leaked in from some other parallel universe. It’s both grounded and skyward sweeping at the same time. More forlorn gentle piano drifting onshore in ‘Lost’ that it’s looping and repetition effectively acts like a hypnotist as over it’s 8 minutes and 35 seconds encouraging you to slowly get lost in your own awareness melding multiple influences once again, there’s even the haunting bass drone of what is possibly a didgeridoo. But by no means is that a criticism, it works brilliantly. The embrace of ‘Lost’ falls way like a gentle breeze leaving us with the final track ‘Bring ‘em War’ with techno glitched sounds and heavy beats, spiked with what sounds like AC/DC guitar samples building, then flipping into a Screamadelicaesque funk and dance wave that could effectively bring the house down if turned up to 11 at a live gig.